Trunyan Village is not a place for the faint hearted. Located on the shores of Lake Batur in Kintamani, shielded by steep and jungled slopes, the Bali Aga people in this village have very different traditions from the majority of Balinese people. Here, dead bodies are not cremated or buried, but rather decayed in a ‘cage’ of bamboo. Like most Balinese, the Bali Aga follow Bali’s eccentric brand of Hinduism, but every village, like the group of villages Trunyan heads, also has its own religious rituals and beliefs. A tangled, mossy tree that looks like an ancient banyan dominates the open-air cemetery. Locals believe that the tree, called Taru Menyan, or “fragrant tree”, overpowers the rotting smell. 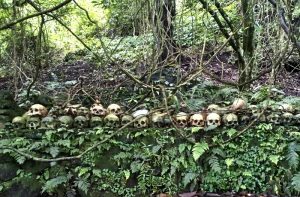 As soon as a corpse has decayed, the remains of the skull and bones are then neatly arranged at the bottom of the temple in accordance to cultural belief. 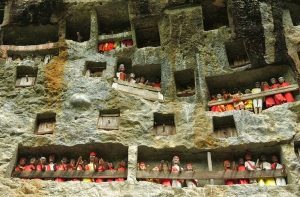 Tanah Toraja sits between lofty mountains and sharply rising cliffs in the central highlands of Sulawesi. 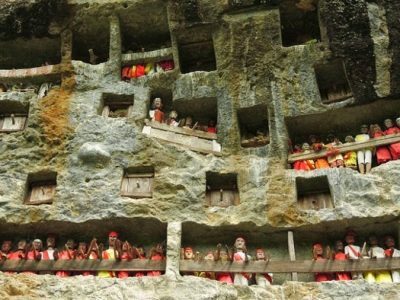 Home to the Toraja people, they adhere to age-old beliefs, rituals and traditions. In one of the most complex burial rituals in the world, death is actually celebrated by the Torajans, and the more extravagant the funeral the better. In order to achieve this families often take months and even years to save up for a funeral, keeping the dead preserved in their homes, feeding, bathing and even occasionally taking them for a stroll outside. A person is only declared dead after the ceremony has begun, at which point a number of buffalo and pigs are sacrificed to feed the village, fueling an 11-day ceremony of music and dancing. Next, a parade takes the deceased towards a cliff where their coffins are hung on its face. To replace now outlawed traditions of the changing of clothes of the deceased, wooden life-sized effigies are placed on the cliffs, fully clothed and jeweled. The Torajans believe that these sculptures provide the dead with a body watching over them for eternity. 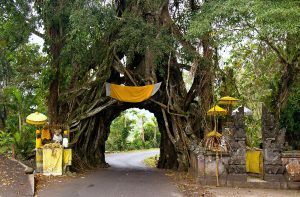 Bunut Bolong is essentially a sacred tree so large that it has a tunnel with the road passing through it. Positioned on a slope situated in between a clove plantation and lush rainforest in the village of Manggissari in West Bali, stands this massive bunut tree. The Balinese hold the tree sacred (as with many large trees) as possessing a soul and place of refuge for denizens of the unseen world. The bunut tree is a type of giant fig, related to the more common banyan tree. Bolong means ‘hole’ in Balinese, thus translating to ‘tree with a hole in it’. And it’s a huge hole indeed, able to accommodate up to two cars side by side. 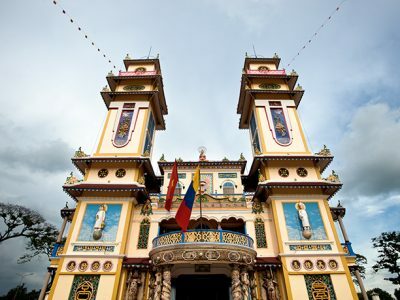 Suoi Tien Cultural Amusement Park fast became an entertainment hotspot for local people, though it is also considered as one of Ho Chi Minh’s strangest Buddhist parks. 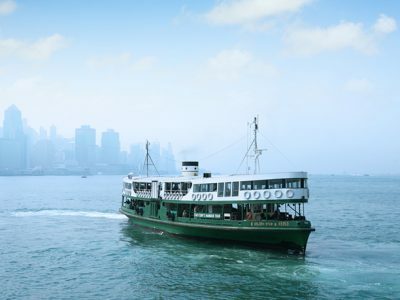 Built in 1995, the amusement has meandering waterways with boats shaped like turtles and dogs, as well as water slides that emerge from the mouths or beards of gigantic Buddhist sages. 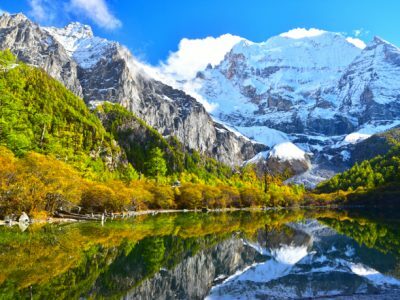 There are gardens full of Buddha monuments, a lake with a statue of a turtle supporting the world – and of course temples. There’s also a zoo housing over 1,000 crocodiles which visitors are allowed to feed using raw meat attached to fishing poles. Older visitors may also be attracted to the Unicorn Palace. Despite the name, it’s actually a walk-through tunnel that houses gory displays of the nine levels of Hell (according to Buddhist beliefs), such as humans getting ripped apart, eaten by various animals and dumped into boiling vats. Local people often gather at this popular theme park to light incense at the numerous prayer halls, a favored pastime during special festivities. 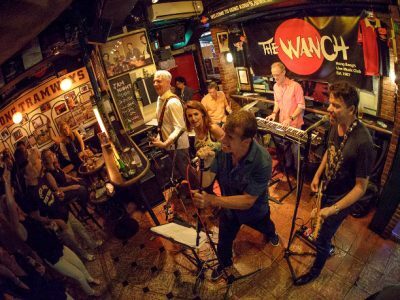 On entering Baan Dam ‘the Black House’ you will notice an entire elephant skeleton, snake skin table runner and thousands of animal-remains. There isn’t just one hose, but a group of black colored houses, all built in the ancient Lanna style. These Black Houses were not built for living in, but to collect and show the spirit and inspiration behind designer Thawan Dutchanee’s collection. 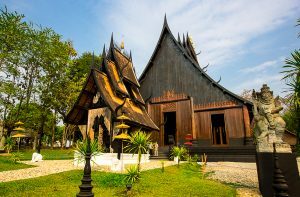 Everything at Baan Dam is black, or at least gives off a dark aura, and each one of the 15 houses is embellished and furnished with animal remains. The animal remains are intricately arranged, giving off a beautifully unique yet mysterious tribal vibe. There is a conflict of emotion, between appreciation of art and a sense of evil coming from the dead animals. Supposedly they all died from natural causes; an idea that makes the place more spiritual and less sadistic. 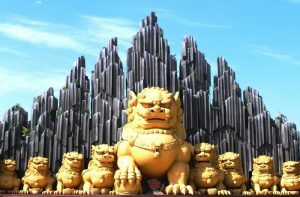 The main temple has a black tiered roof with curved metal points jutting from the sides. Inside is a long wooden table with benches on both sides, lined with an incredibly long snakeskin runner. One hut, designed like a Budhist stupa, contains a circular room lined with chairs made of buffalo horns and skin. The centerpiece is a giant crocodile skin, painted black and surrounded by candles. Baan Dam is Thawan Duchanee’s artful portrayal of hell. The opaque decor and dead animals adorning each room make Duchanee’s estate the complete opposite of the nearby White Temple, the glimpse of heaven designed by his teacher Chalermchai Kositpipat.